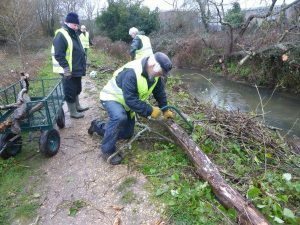 Management of Brook Meadow is essential to maintain an appropriate habitat for wildlife and to enhance the biodiversity of the site. 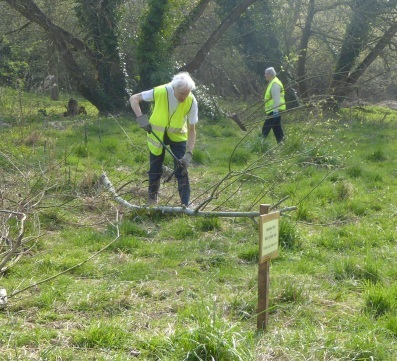 To achieve this, the conservation group works in co-operation with the local Council and other agencies to keep the meadow in good order both for wildlife and for public use. 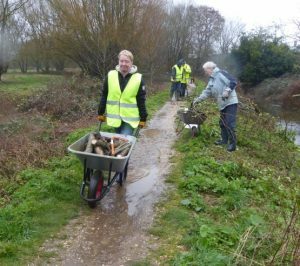 It holds regular conservation work sessions to manage grassland, scrub and woodland and, generally, to keep the meadow clean and tidy. 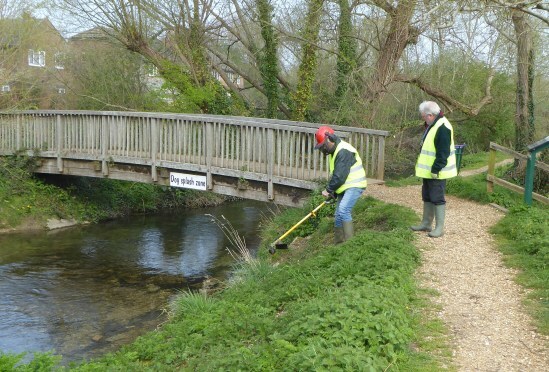 The rivers are primarily managed by the Environment Agency to maintain a good flow of water, avoid flooding, and to create a good habitat for fish, Water Voles and other riparian wildlife. For Brian’s wildlife observations go to . . . 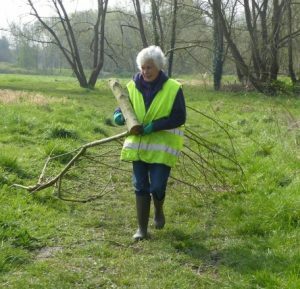 Regular conservation work sessions on Brook Meadow take place on the 1st Sunday and the 3rd Thursday of each month throughout the year. For a trial period starting in January 2019, work sessions will start 30 minutes earlier than usual at 9.30am with a guaranteed finish time of 12 noon. Everyone is welcome and tools are provided. We meet at the new tool store HQ at the end of Seagull Lane. 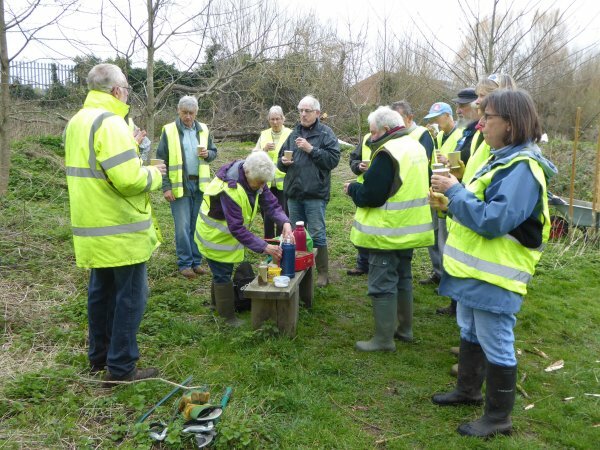 Safety for all volunteers is a priority and risk assessments by trained members are given at each session. There is a break when refreshments are served. 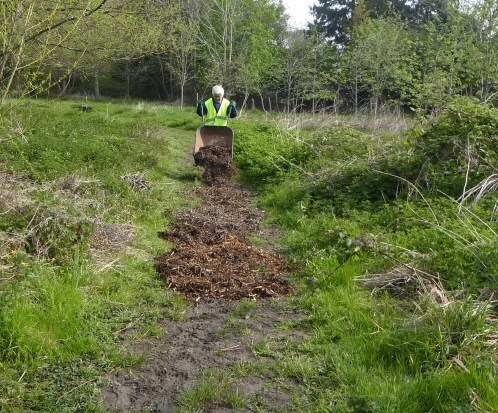 The main tasks include cutting and clearing of the grassland and scrub, removing broken tree branches and keeping pedestrian paths open and clear of obstacles. Clearing litter is a priority. Children and students from local schools and colleges are welcome to join in for work experience. Eleven volunteers (including leader) turned out on a calm mid Spring day. The weather featured hazy sunshine and warm (18°C) with very light wind. Reg Newnham and Colin Brotherston were leading. 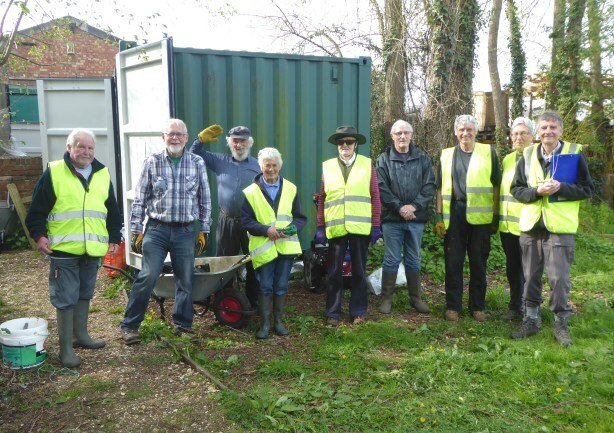 Nine of the volunteers arrived at the start time. 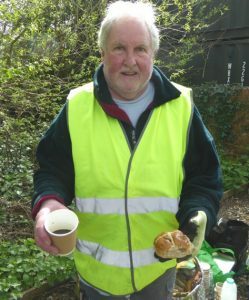 We welcomed a new volunteer; Graham Pitney at 10.00 and one other arrived between 10.00 and 10.30. After the usual brief welcome and safety instructions, including a more detailed discussion about how to use loppers, and wildlife update from Brian, tasks were described and allocated. 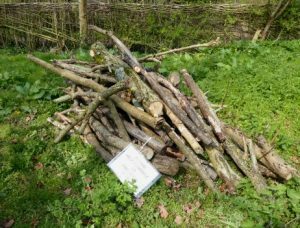 1 Start a bonfire and burn scrub and small branches which have accumulated in the Seagull Lane patch (SLP) and North Meadow (NM). 2 Barrow chippings from Seagull Road gate to spread on the muddy paths east of the flower rich area. 3 Water new plantings along river south of the north bridge. 4 Re-enforce dead hedge by S-bend. 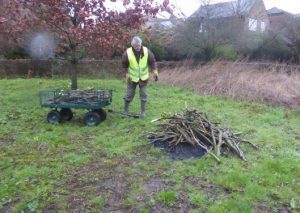 Maurice and Reg arrived early to start the bonfire and begin to gather scrub from the SRP. 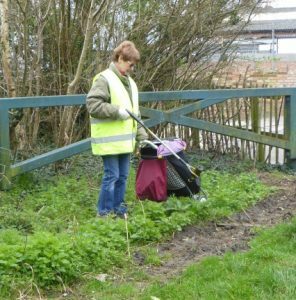 Maurice cleared some grass paths using the power scythe. 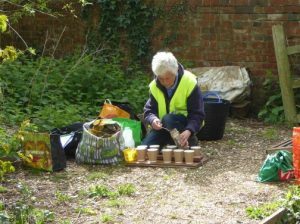 Pam collected dog food which is being distributed on the meadow. This is an unpleasant and unwanted problem which requires further watching to find out who and why this food is being put on the meadow. 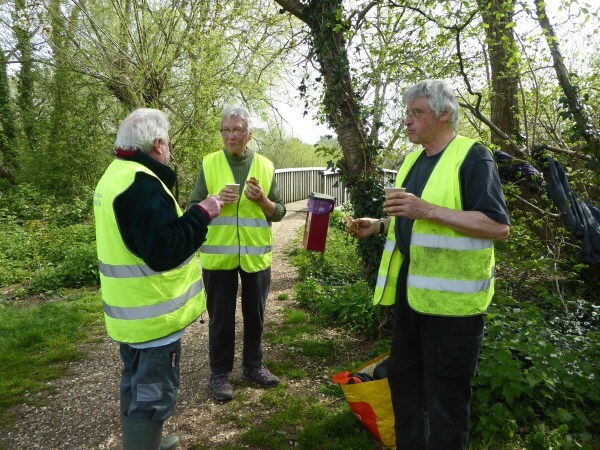 Most volunteers arrived promptly at 9.30 when tasks where described and allotted. 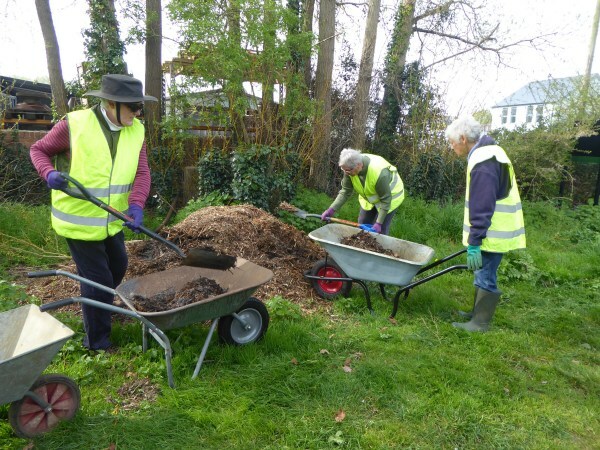 Pam, Diana and Suzanne set out to barrow the wood chippings to the muddy paths east of the flower rich area. It is hoped that the chippings will encourage visitors to use the path rather than make tracks to the side. 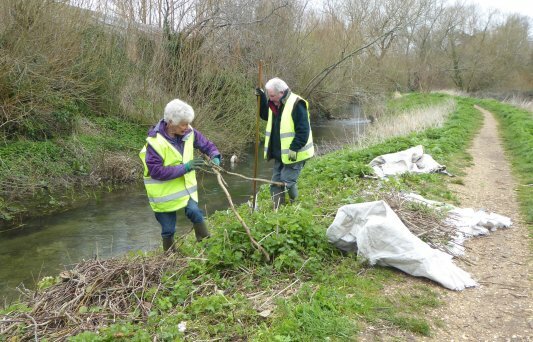 Dan started by donning waders and going into the river where he passed water to Terry to put on to the new planting. 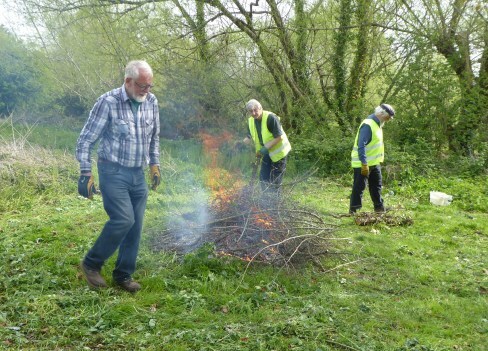 Reg and Tony continued to feed the bonfire which was burning very well in the warm dry conditions while the remained collected scrub and branches. A welcome stop for coffee at 10.45 with a good selection of biscuits and (cold) hot cross buns. Thank you Pam. The coffee break was held at HQ. After coffee work continued on the tasks already started. At about 11.30 the team stopped feeding the bonfire and started measures to put it out. 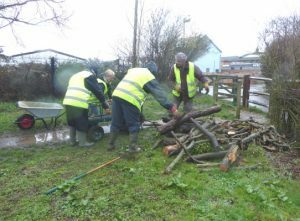 Larger branches were cleared from SRP and sawn up for collection by members of the public. 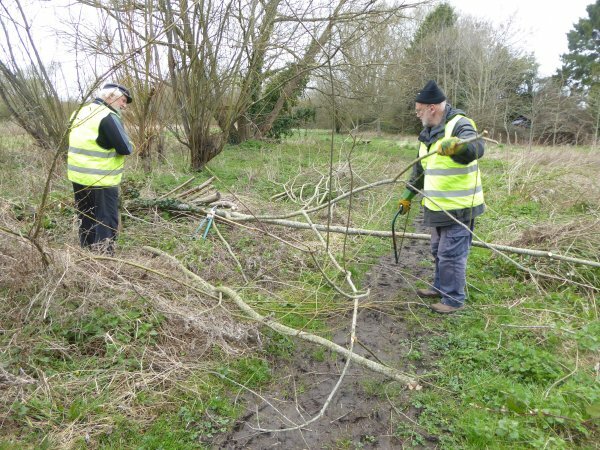 Terry and Dan made a brief start on placing poles in the S-bend dead hedge but time ran out and this task awaits a further work session. At 12.00 all tools were returned to HQ and a productive session was finished. Several what I assume were Small White butterflies were fluttering around the meadow, but none stopped long enough for close inspection. They are a couple of weeks later than usual. Here is one taken last year. 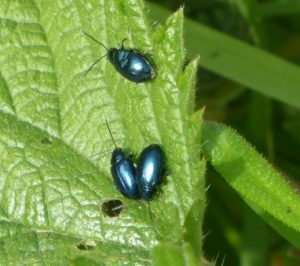 There was a collection of about a dozen blue Flea Beetles (Altica lythri) on the nettle leaves on the main river path. These are fairly common on the meadow in spring time. They get their name from their ability to jump when touched. 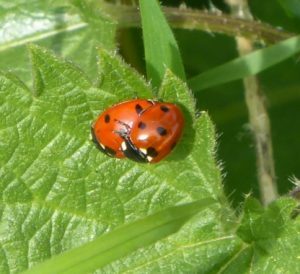 Nearby was a pair of 7-spot Ladybirds mating. 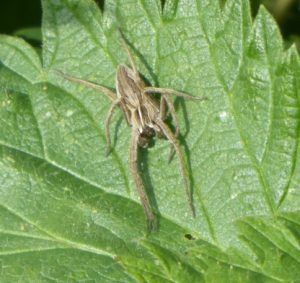 I saw dozens of young Nursery-web spiders ‘sunbathing’ on the nettle leaves along the main river path, some with front pairs of legs held rigidly straight out in front of them, others (less mature?) with their legs twisted up. These spiders get their common name from the dense silk nursery tent that the female builds for her spiderlings. 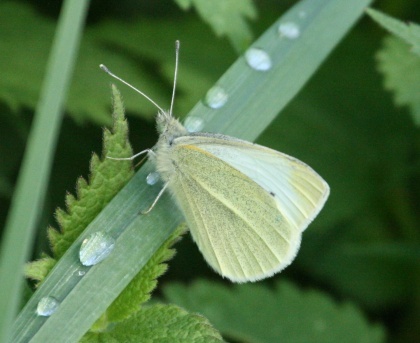 These are often seen dotted around the meadow in summer, usually with the female standing guard nearby. 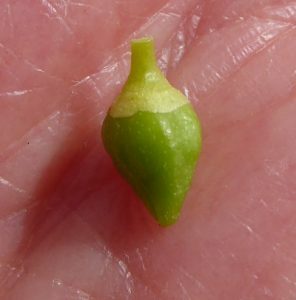 While standing under one of the Black Poplars I listened to the sound of hundreds of tiny green seeds cascading down onto the ground around me, hitting the ground like tiny hail stones. The seeds were all over the ground, resting on nettles and other vegetation. That confirms my earlier speculation about these trees that they are definitely female! 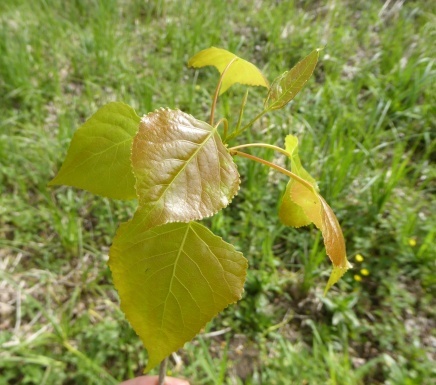 I am moving towards the identification of our two Black Poplar trees as ‘Florence Biondi’ – ‘straight stemmed, graceful with fairly sparse foliage denser at the crown’ (Collins Tree Guide. p.158). Here are some young leaves. 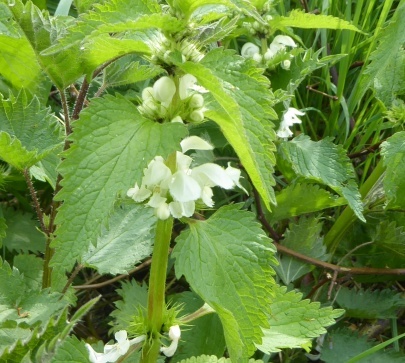 I had a close look at the two Dead-nettle species which we have on Brook Meadow both of which have very attractive flowers when looked at closely. White Dead-nettle is the more robust of the two plants, standing tall, with white flowers arranged in well spaced whorls. It has pointed heart-shaped leaves, which could be mistaken for Common Nettle leaves but they have no stinging hairs. 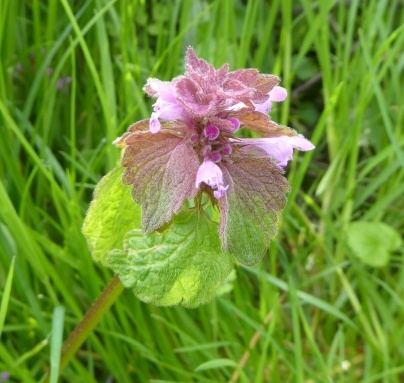 Red Dead-nettle is a smaller plant with whorls of reddish purple flowers and rounded heart-shaped leaves which are stalked. 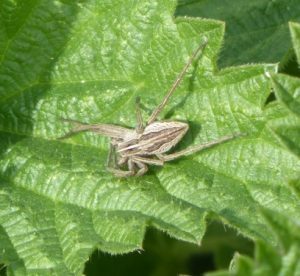 It also has no stinging hairs, though its leaves are unlikely to be confused with Common Nettle. I gather young plants have edible tops and leaves, though personally I prefer to see these lovely plants untouched in the wild. I was interested to learn recently that Red Dead-nettle occasionally has white flowers, though I have not seen this aberration myself. Henbit Dead-nettle is a similar plant to Red Dead-nettle, but has unstalked leaves. Both Dead-nettles are very ancient introductions to this country and are now common and widespread. 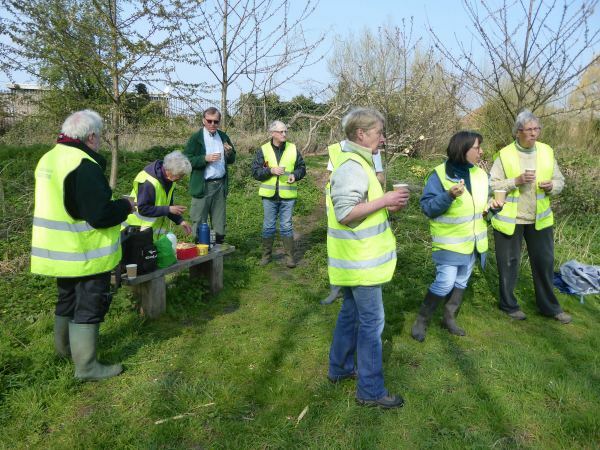 Eight volunteers gathered on a lovely bright Spring morning to hear about the tasks planned. They were reminded of their joint responsibilities to each other with regard to health and safety and of the care to be taken with particular tools, tasks and locations. 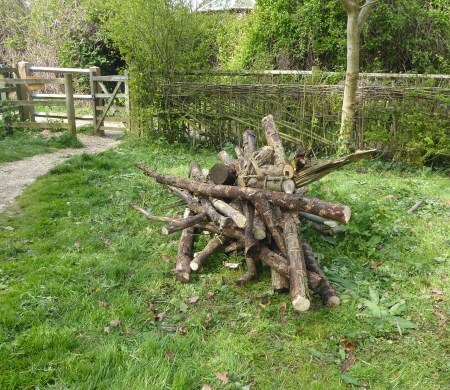 The main task of the day was to build a branch barrier around the flower rich area in the North Meadow using brash from piles nearby and more distant. 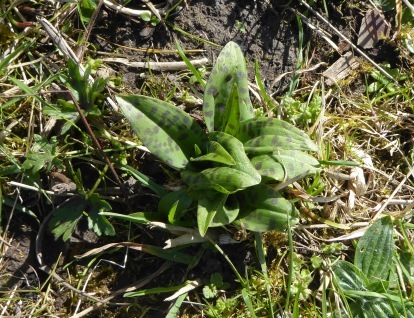 Brian mentioned that he had already found the early leaves of a Common Spotted Orchid in the area. Signs were erected to encourage the public not to enter. Brian found both Divided Sedge and Distant Sedge to be showing well.These are key indicative species for the meadow. 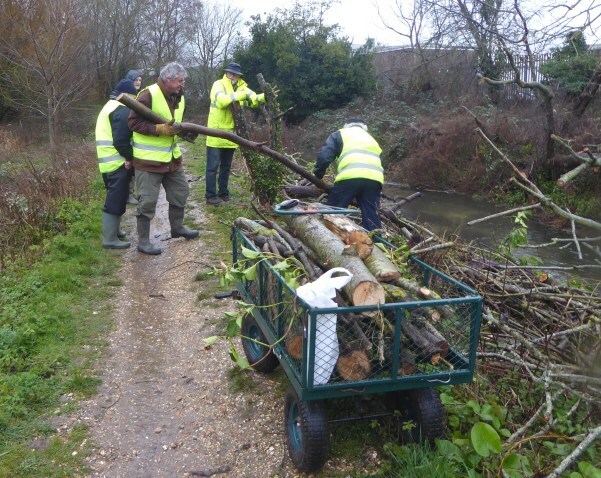 Whilst most of the team built the barrier, Geoffrey collected and sawed up thicker branches and logs and trolleyed them to the Seagull Lane entrance for offer to the public. 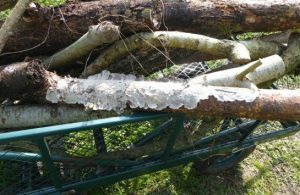 Geoffrey showed Brian some fungi that he noticed growing in crust-like fashion on one of the dead logs he was moving in the trolley. A Google search led Brian to so-called Crust (or Corticioid) Fungi which typically grow on dead logs. 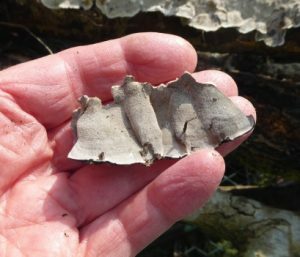 His very tentative identification is Peniphora quercina – which Phillips (Mushrooms p. 240) says is common on dead deciduous trees. 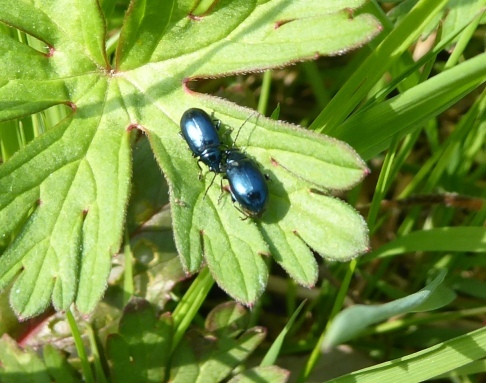 Geoffrey also called Brian over to see some a cluster of tiny bright blue beetles on the west side of the north meadow. 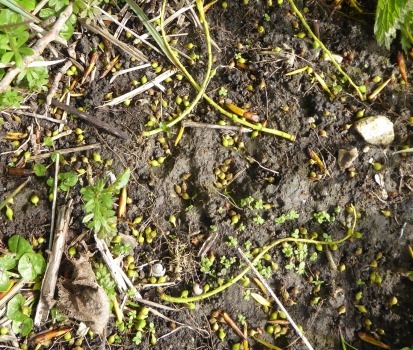 Brian identified these as Flea Beetles (Altica lythri) which we see regularly on Brook Meadow in early spring. Brian was able to demonstrate their famed ability to jump when touched, a sure way of identifying this small creature. 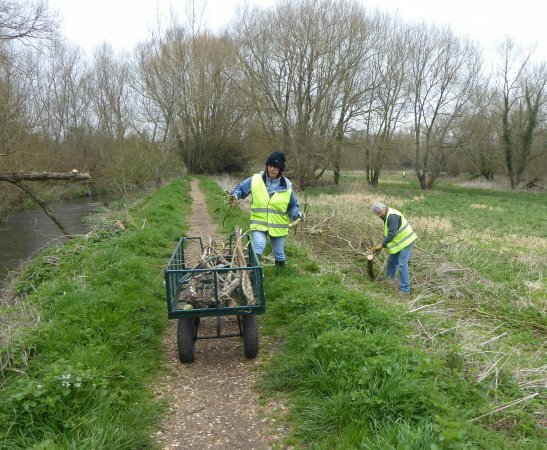 Terry and Dan strimmed early nettle growth around the reed bags on the Ems bank South of the North bridge; and also watered the bags which had become dry. 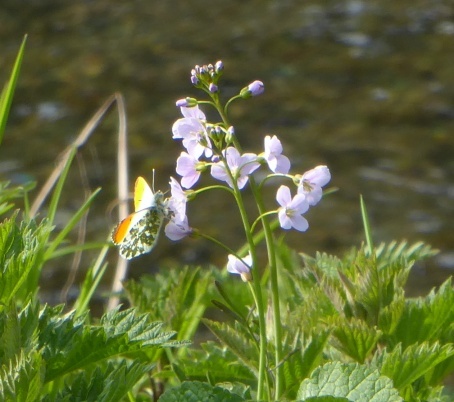 The first Orange Tip of the year on Brook Meadow was flying on the river bank as Dan and Terry were strimming. It was attracted to the first Cuckooflower of the year on the meadow Brian managed to get a shot of the insect feeding on the flowers. The photo shows well the green mottled underwings of the insect. It was warm work and Pam’s drinks were most welcome at ‘half-time’. 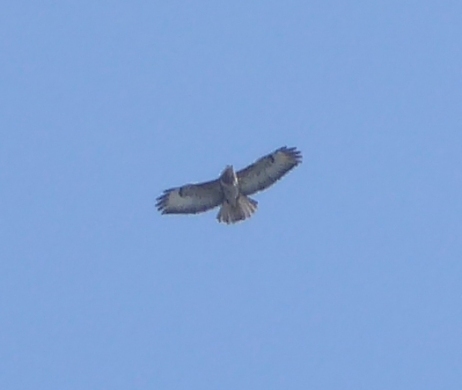 During coffee time we all had a good view of a Buzzard soaring over the meadow which Brian was lucky enough to get a half-decent photo of. 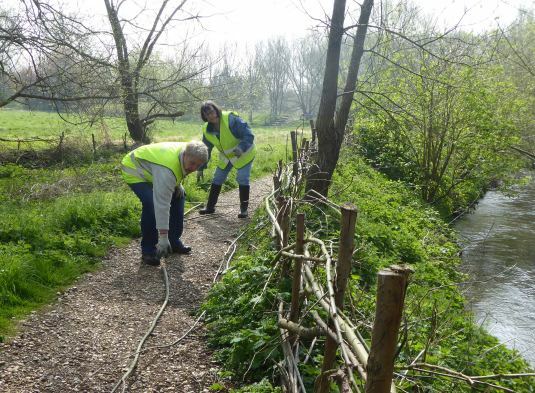 Following the break Geoffrey, Terry and Dan continued their earlier tasks and the ‘barrier team’ repaired the dead hedge around the ‘S’ bend using material cut previously and some fresh cut. 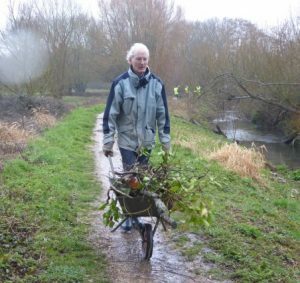 A good and warm morning’s work led to a finish slightly earlier than usual..
Brian was grateful to volunteers for clearing a gap on the fallen Willow for him to lean against. Thanks. 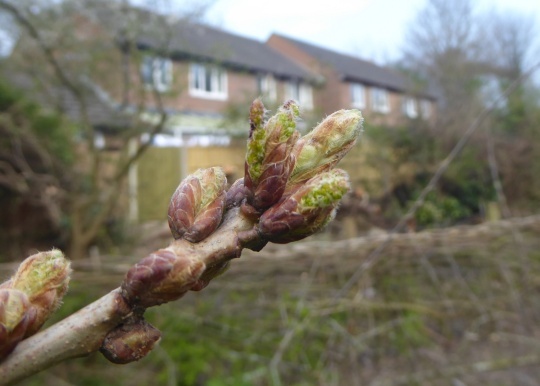 The leaf buds are almost bursting on the Oak saplings on the Seagull Lane patch. The brown spikes of Greater Pond Sedge and Lesser Pond Sedge are also out on the Lumley area and the River Ems respectively. 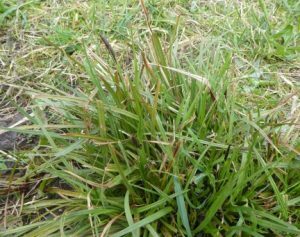 Leaves of Hard Rush are showing well on the orchid area and Sharp-flowered Rush is abundant on the Lumley area. 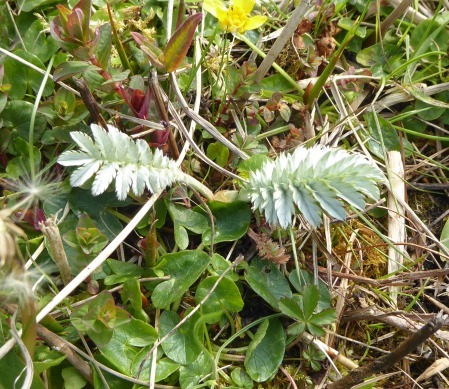 The attractive leaves of Silverweed are now widespread over the Lumley area. 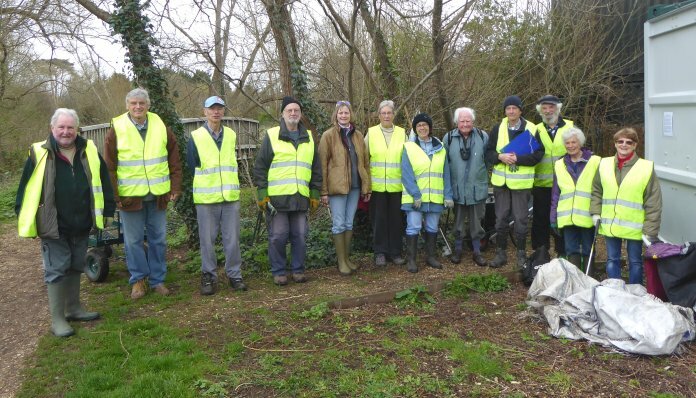 Thirteen volunteers (including leader) turned out on a calm early Spring day. The weather was overcast and mild (12 Deg C) with no wind. Colin Brotherston was leading. All the volunteers arrived at the start time. After the usual brief welcome and safety instructions task were described and allocated. 1 The clear scrub from Palmers Road copse and plant five alder whips. 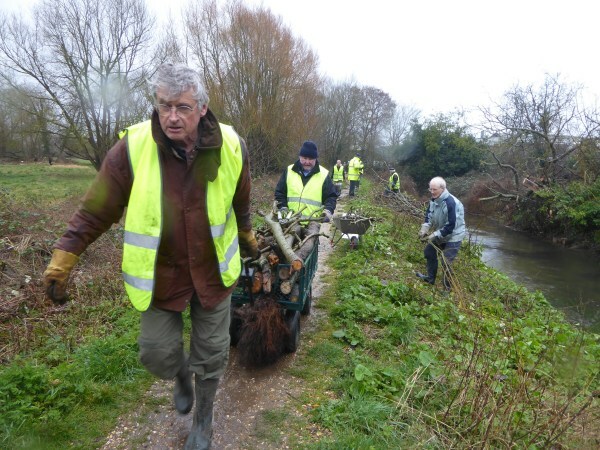 2 Remove fallen and felled wood from the river bank and path side. 3 Cut-up and clear fallen tree south of Beryl’s seat. 4 Move part of the grass dump in the north east corner to make way for the line of the flood defence barrier. 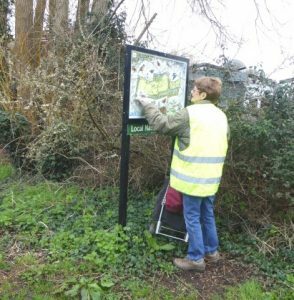 5 Litter pick and clean signs. 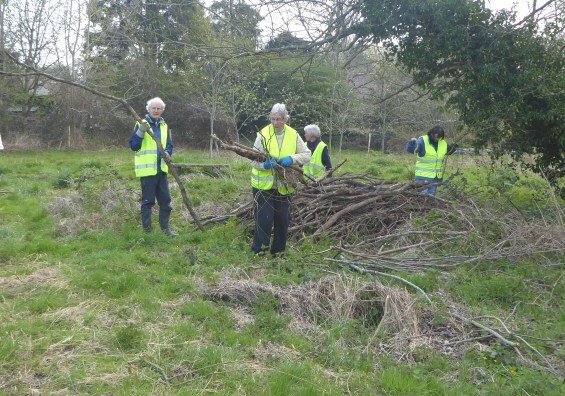 Pam, Dan and Dave set out to clear wood from the river bank in the north meadow and move it to add to the hibernacula. Larger pieces were taken to HQ where they could be collected for stove burning. 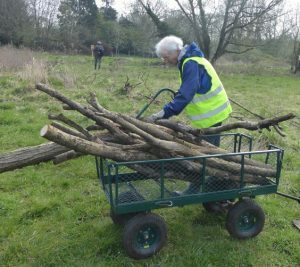 Catherine and Reg used the trolley to collect the larger pieces of wood. 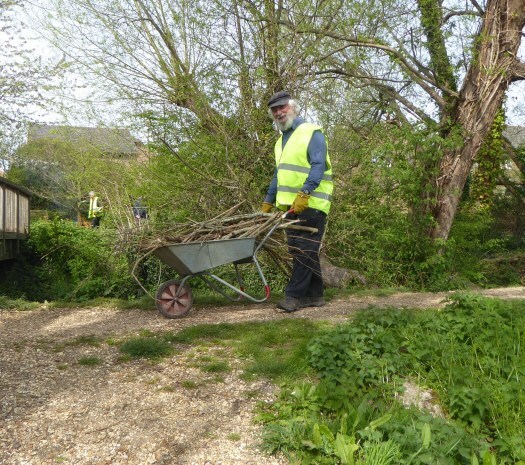 They cleared wood from the east bank in the Seagull Lane patch and assisted Pam and David. Tony and David (another one!) set to work on the job of cutting up the tree south of Beryl’s bench. 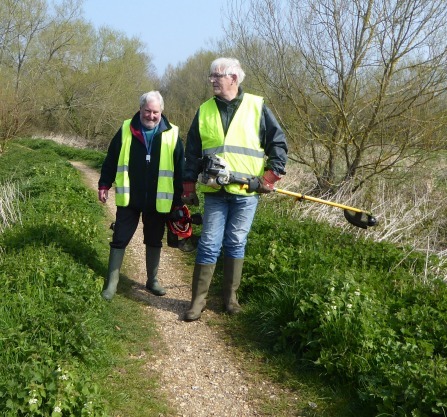 Kathy, Diana and David (yet another one) started on the task of moving the grass dump away from the path of the flood protection system. A welcome stop for coffee at 10.45 with a good selection of biscuits. Thank you Pam. After coffee Maurice took Tony and David on to his team to plant the alder whips. This task was completed. 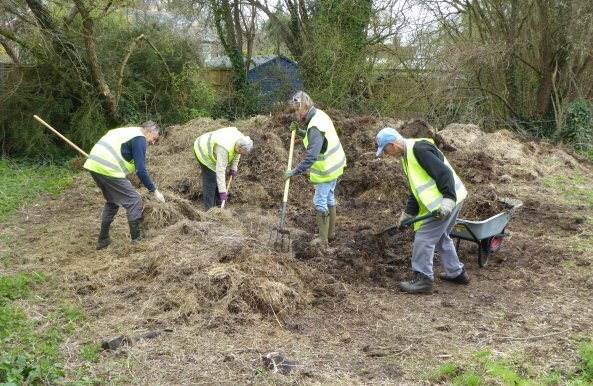 The grass dump move was continued with Diana, David and Catherine and part time myself. By the end of the session this job had been completed. Well done! 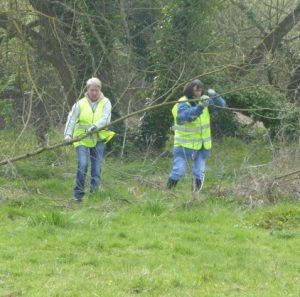 Pam Reg, Cathy and Dave continued to clear wood and prepare willow for future dead hedging. There is still more of this task for future work sessions. For Brian’s Wildlife News including . . . 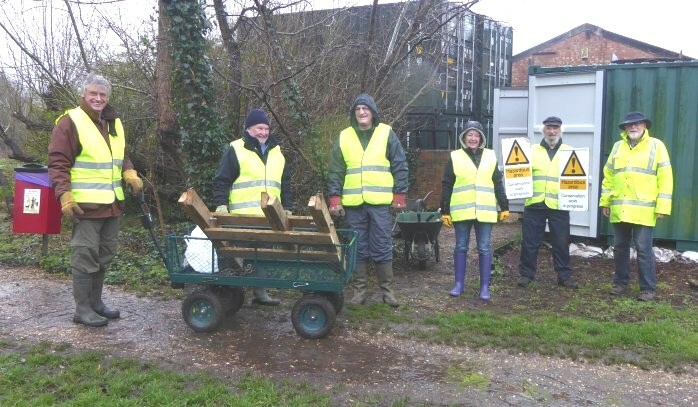 I awoke this morning, which, apart from being a relief in itself, I wondered if, after a manic week of tree work, a miserably wet first Sunday morning of the month would actually materialise as a volunteer work session. Let me explain, on Monday, in Palmers Road Copse and two jobs on North Meadow seven parts of trees were removed by Mike Reed’s firm to variously provide more daylight to the ground, create space for the planting of several trees provided by the Tree Wardens and remove some branches that were in danger of falling into the Ems. 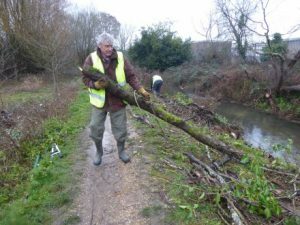 On Tuesday and Wednesday the Environment Agency arrived to remove the dead trees on the west side of North Meadow that had collapsed into the river. The debris was placed on the steep river bank beside the raised gravel path. 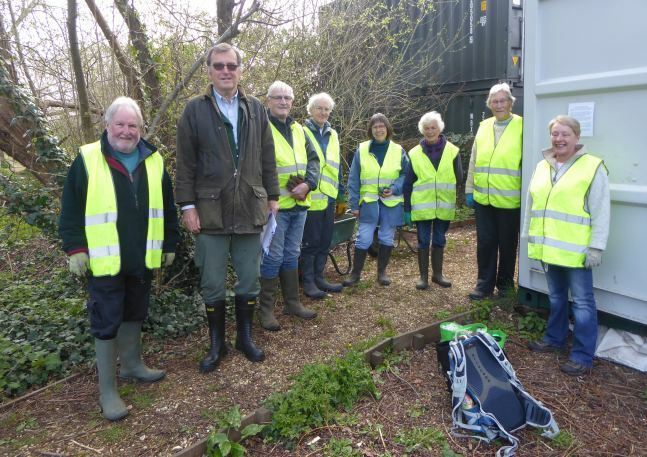 Thursday and Friday saw tree work of another sort – a 25 metre row of trees 4 to 5 metres tall planted as a hedge along Seagull Lane some years ago, were earmarked for laying, as had been done on two previous occasions. – See report of this work below. 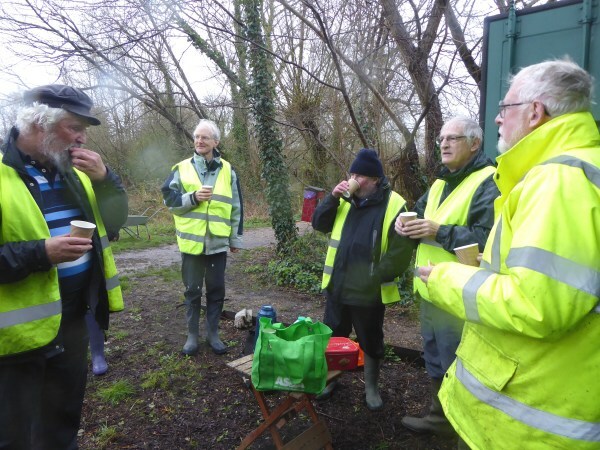 So, this Sunday arrived, and Debi, Tony, Terry, Dan, Reg and a new volunteer Geoffrey joined me in the damp at HQ to sort out the tools, talk about the single task of clearing the tree debris on the river bank. 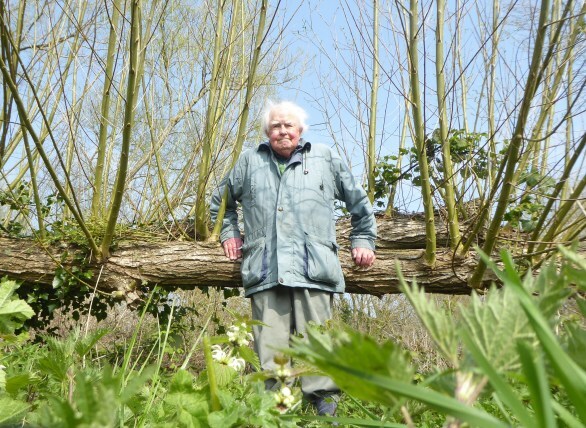 The precautions to be taken were identified and after Brian’s usual record photo we set off with barrows and cart laden with saws, loppers and saw horse along the bank. Many loads of branches great and small were trundled to Seagull Lane Gate and separated into two piles of logs for burning and smaller items for kindling. At about 10.45 we took a short break for refreshments brought by Dan as Pam was occupied elsewhere. After that we returned to clear as much of the debris as possible before deciding to call it a day at 11.40. Tools were returned to store and the weary volunteers trudged homewards feeling justifiably proud of a hard but awkward morning’s work. 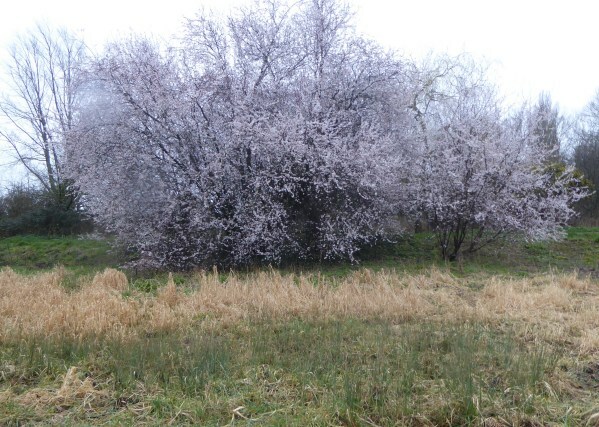 The white Cherry Plum blossom is standing up well to the strong winds. 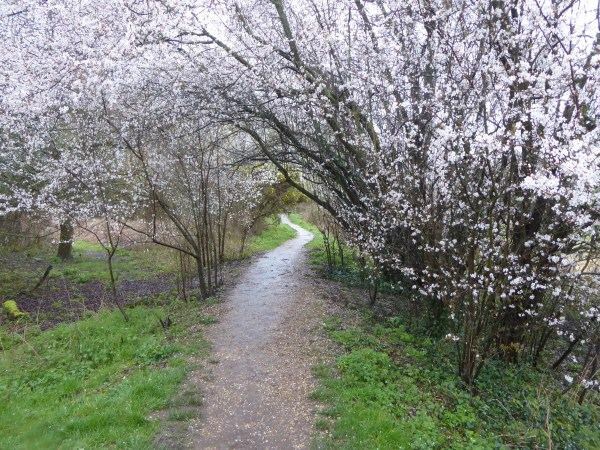 The tree on the causeway forms an attractive archway along the path. 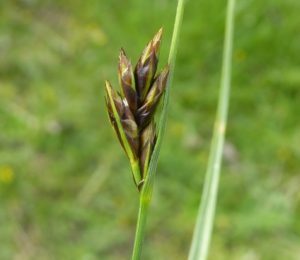 Looked at from the meadow the mass of blossom is fronted by the straw-like leaves of Reed Canary-grass and the dark green leaves of Hard Rush. 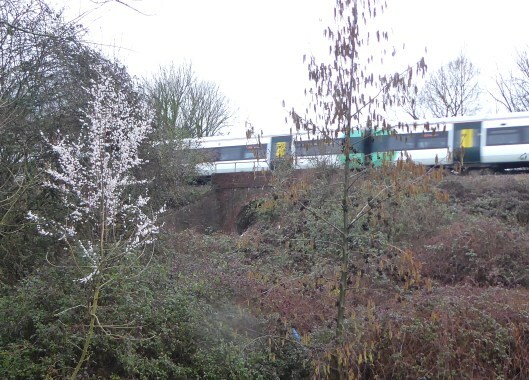 The bush full of white blossom in the north west corner near the railway line with stands next to an Alder laden with catkins is also Cherry Plum and not Blackthorn. 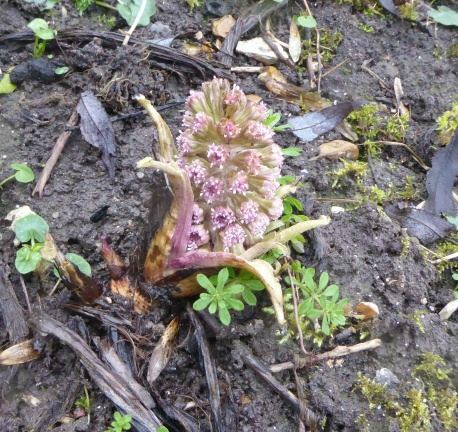 Many flower spikes of Butterbur are showing well and will soon be countable! Video clips from earlier work sessions . . .